Living in a waterfront home is a luxury and seawalls permit you to enjoy the waves without their damaging, erosive effects. While waves and wakes are often beautiful forces of nature, they can also be disruptive. Quality seawall construction protects your property from this damage. Retaining walls repel waves and hold back the ground, preventing it from washing away during storms. Seawalls are vital to the preservation of your waterfront property. Our seawall construction projects have ranged in size from small repairs to installation of over 2000 LF of new seawall. We have extensive knowledge in the construction of concrete, vinyl and steel seawalls. Our installation process ensures our seawalls are durable enough for all marine environments whether your project calls for concrete, vinyl or steel. To maintain your property value, you must secure and maintain your seawall. Heavy rains and hrricanes may create problems due to the lack of maintenance and deterioration of your wall and berm erosion. 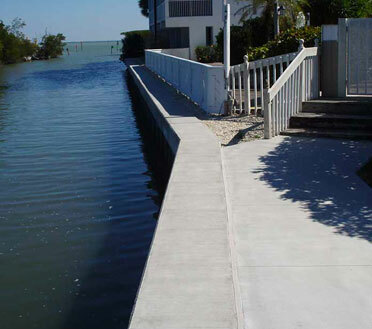 If you notice a loss of soil, cracking, sinking or rotation of your seawall it is imperative that you have your seawall inspected immediately by Florida Marine Construction. 3000 lineal foot of seawall panels awaiting installation Weeks Fish Camp Marina. Reinforcing steel placement for concrete seawall slab. 600 foot of steel sheet piling cantilevered wall design installed in front of old seawall. Florida Marine Construction completion of concrete seawall panels for Weeks Fish Camp. Vista of Steel Sheet piling installed 18” in front of concrete seawall. View of reinforcing steel placement within formworks. Cantilevered Steel Sheet Piling Wall, Bayside Marina. Sheet Piling wall completed IN North Naples, Florida. Upland vinyl seawall to increase lot elevation. Concrete Seawall Installation utilizing modular barge within lake. Florida Marine Construction installed 5,000 lineal foot of concrete seawall at Sweetwater Landing. Vinyl seawall installation complete, templates removed and awaiting formwork.